World's Biggest and Best Online Guitar Resource! Quicksilver Guitars are our premiere Directly Coupled Bolt-In guitars built for tone, beauty, performance and versatility. Get a Custom Quicksilver guitar tricked out any way you like it, with your choice of wood combinations, electronics and hardware. Why settle for off-the-rack? A Tale of Two Sharks... This photo of the Roman Shark built by Master Builder Mike Risinger is from the August 2012 issue of Guitar World. 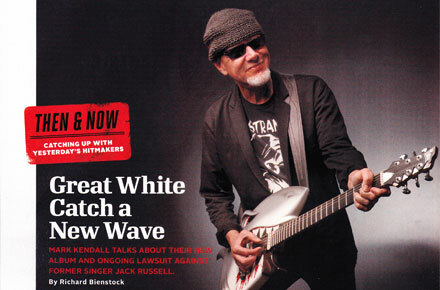 The issue features an inteview with Mark and photographs of Mark with his new Roman Shark Guitar. 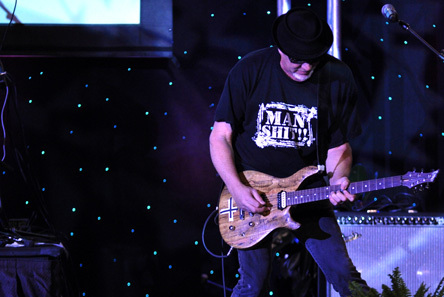 Paul Crook playing his Quicksilver Guitar onstage. 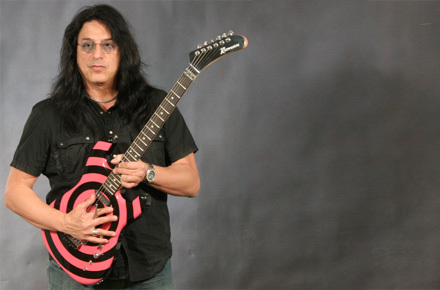 Paul has played his Roman Abstract and Quicksilver guitars worldwide with Meat Loaf, Anthrax and Sebastian Bach, and Roman Guitars is very happy to have Paul as an Endorser. 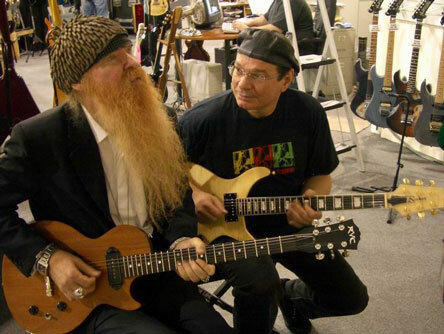 In this picture we see Billy Gibbons playing a Roman RVC Mojoman Guitar and Bruce Conte of "Tower of Power" playing a Roman Baker Guitar. Solo Artist, Singer, Actress, Designer. 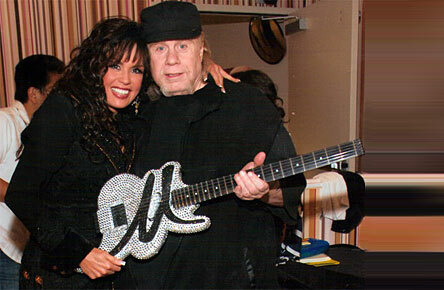 Marie and Ed Roman backstage with her custom built LSR Guitar. Marie was very hands on in the design of this instrument. It has over 3000 Swarovski Crystals inlaid into the top. Country music's hottest singer, songwriter and guitarist. Keith came into the shop, picked up this Quicksilver and bought it on the spot. He's pictured here with his chambered Quicksilver Guitar. 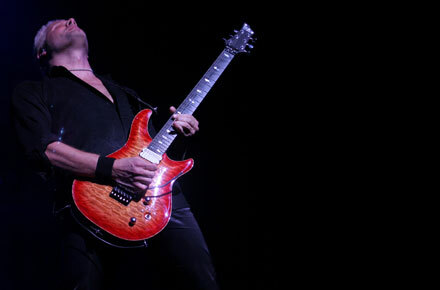 Mark Kendall of Great White, playing in Las Vegas in October 2011. 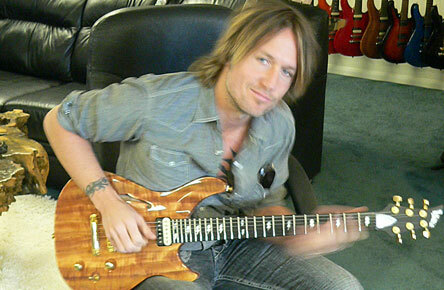 He's playing Ed's personal Spalted Maple Quicksilver Guitar. We built Mark a new Quicksilver Shark Guitar that's playable as well as badass. Eddie Ojeda, lead guitarist of Twisted Sister stopped by the shop this March and picked out one of our Roman Glock Guitars that is reminiscent of his famous Kramer Bullseye Paintjob. We're very happy to see Eddie with a Roman Glock! Guitarist, shredder extraordinaire. 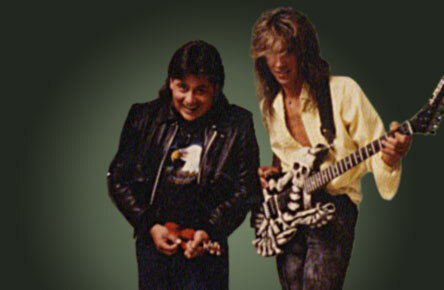 George Lynch made the J Frog Skull N Bones Guitar Famous. He's shown here with the Skull N Bones and its designer Johnny Garcia, aka J Frog. Guitarist, Producer, Writer, Performer. 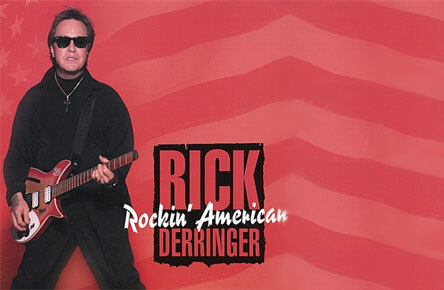 This Rick Derringer album cover features his Ed Roman LSR Guitar. 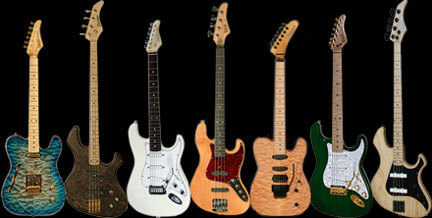 Rick has played numerous Roman Guitars, including our Pearlcaster Guitars. 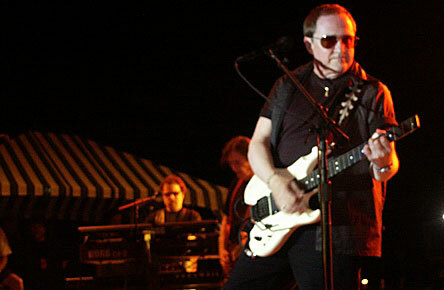 Buck Dharma, founding member of Blue Oyster Cult, is a world renowned songwriter, singer and guitarist. Buck is pictured here in 1999 playing a Roman LSR Cheesburger Guitar. We've built several guitars for Buck, including an LSR EXP Custom Headless Guitar. Here's we have the legendary Leslie West of Mountain with a Quicksilver Guitar. Leslie's style and tone have been immitated by many but duplicated by none. 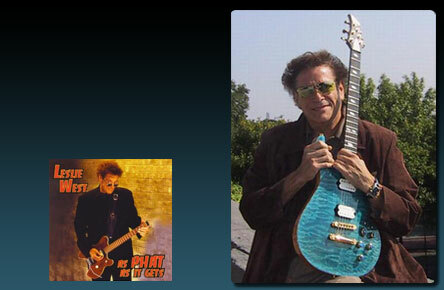 Leslie is known for his love of our LSR Guitars as seen on his album cover below. 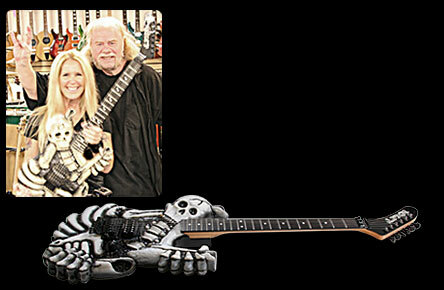 Lita Ford dropped by the Custom Shop when she was last here in Las Vegas. She's pictured here in the Compound's Grand Guitar Room, more commonly known as Ed's Office, checking out a beautifully sculpted J Frog Skull N Bones, the guitar made famous by George Lynch. Solo artist, shredder and studio musician. Ronny has played with many top names over the years. 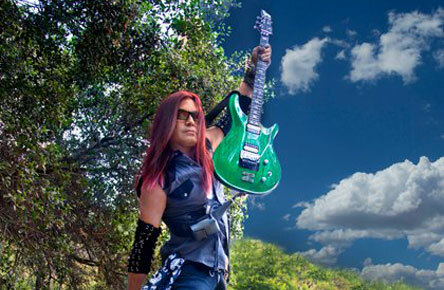 Ronny is pictured here with his Quicksilver Guitar. 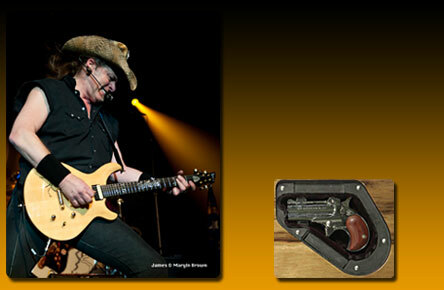 Here we see Ted Nugent playing a custom Quicksilver Guitar. This particular Quicksilver has a custom petroglyph on a Spruce top and a hidden compartment in the back for one of Ted's little friends. Roman Vintage Custom (RVC) Guitars are Set-Neck Guitars, built with traditional methods with a vintage look, feel and tone. You can order your RVC Blues Deluxe or Traditional Single Cut with any electronic or hardware option your heart desires or select from our in-stock RVC Guitars. Roman Abstract Guitars are Neck-Through-Body Construction. Neck-through-body guitars offer unparalled sustain and superb tone. With hundreds of different models from which to choose, you can create a custom masterpiece or select from our in-stock inventory. Nothing sounds quite like a Mosrite. The Ventures played Mosrite Guitars and helped make them famous. Johnny Ramone and Curt Cobain later discovered Mosrite's unique sound. 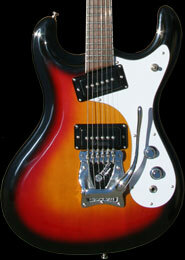 Roman Guitars is your source for authentic new and vintage collectible Mosrite Guitars. Be the next to discover the Mosrite tone and Get that Mosrite Vibe! Pearlcaster Guitars are classic Bolt-On Guitars that boast the Roman All-Acces Neck Joint. The Roman Pearlcaster and Magic Twanger Guitars and the Performer and Lowrider Bass are all of the Roman Pearlcaster family. Duesenberg Guitars of Germany marries Art Deco styling to modern, innovative technologies to produce unusually artistic, sonically advanced instruments. 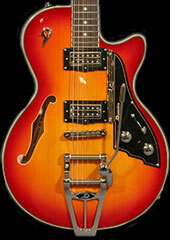 You can now find Duesenberg Guitars at Ed Roman Guitars of Las Vegas. Give us a call and discover the unique German musical engineering offered by Duesenberg. 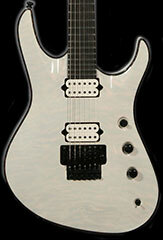 Jackson Guitars are consistently top-shelf guitars. Jackson has been the first choice for many players for a generation. 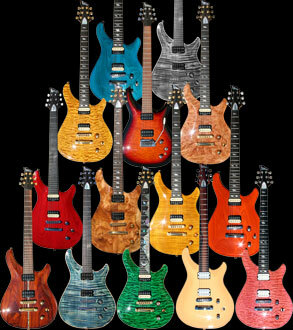 Roman Guitars offers Jackson Custom Shop Guitars, USA Made Randy Rhoads, KV's, Soloists and more, as well as imported Jackson Guitars. George Harrison English Gentleman Guitar. This guitar is lovingly nicknamed the "Ed Sullivan 40th Anniversary Tribute Guitar." 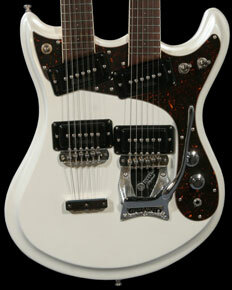 We also have in stock the George Harrison Signature Duo Jet Guitar and the Bono Irish Falcon. 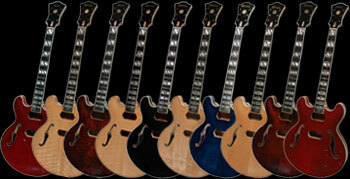 We stock a variety of Kit Guitars with body style and hardware options. 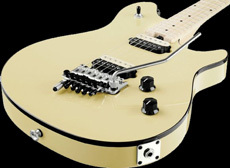 Roman Guitars has EVH Wolfgang Guitars in stock in Solid and Trans Colors. 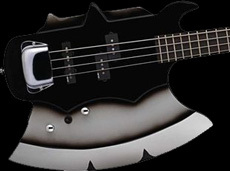 Roman Guitars has the Offical Gene Simmons Axe Bass by Cort. Roman Glock 22 Guitars are Blot-On construction, styled right out of the '80s and in stock for fast delivery. 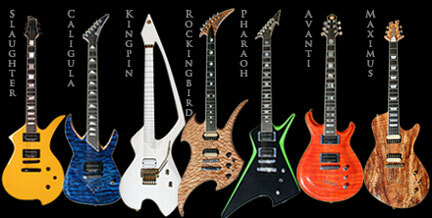 Roman Guitars has a huge selection of Vintage Kramer Guitars: Barretas, Condors, Pacers, Vanguards, Voyagers and more! 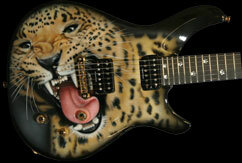 Our Custom Shop can create a musical masterpiece from your favorite artwork or even (gasp) your corporate logo. 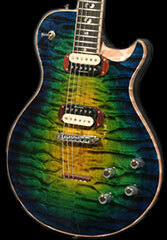 JET Guitars are the finest single luthier guitars in the world and we have them here at Roman Guitars. This guitar is the Prototype for the new 6/12 doubleneck from Mosrite. This prototype is your one-in-a-lifetime chance to own a piece of guitar history. Roman Guitars has Rock Star Autographed and Stage Played guitars. 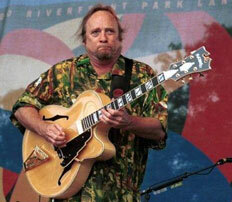 Stephen Stills (Pictured), Mick 7, Paul Crook and More. © 2013 Roman Guitars. All Rights Reserved.